Vermont faces numerous environmental challenges but there are two that need our immediate attention. Greenhouse emissions and resulting climate changes are something all Vermont businesses need to address. Unfortunately, Vermont cannot go it alone and it requires an International effort to slow global warming. Clean water should be our next priority and with the help of our New York, New Hampshire and Canadian neighbors we can make near term improvements to Lake Champlain and the Connecticut River. Our numerous interior lakes are our sole responsibility to keep in pristine condition. Many people think of Vermont as synonymous with a healthy environment and that image is important to our tourist industry and the many products we ship out of State. Lake Champlain contributes $300 million annually in tourism dollars to the Vermont economy and river-related tourism – such as the popular activities along the Connecticut River – generate an additional $109 million in economic activity. Unhealthy water is a real threat to the Vermont economy and our way of life. Each time a beach closes in the summer due to blue-green algae, our state gambles away our reputation as a beautiful place to visit, recreate, and do business. More importantly, no Vermonter should ever need to question the water they use for drinking, bathing or recreation. The Federal government has appropriated $8.4 million for the Lake Champlain Basin Program, which is a helpful start. And this year, the Vermont Legislature passed a bill redirecting funds from unclaimed bottle deposits away from beverage companies to into the state’s Clean Water Fund. These are both important steps forward and should be celebrated. Elected officials will return to Montpelier next January with a looming deadline to determine how to continue financing projects that clean up our lakes and rivers – and stop pollution before it gets there. This is a debate that has occurred before and the Legislature and Gov. Scott have numerous studies, including a recent one by State Treasurer Beth Pearce, that detail the pros and cons of the options on the table. This is not a debate about how much we can afford – it’s a debate over how much we value Vermont’s way of life and green economy. We should insist that everyone – politicians, municipalities, industry and agriculture leaders make the commitment that our lakes, rivers and streams are something we can all enjoy and be proud of. 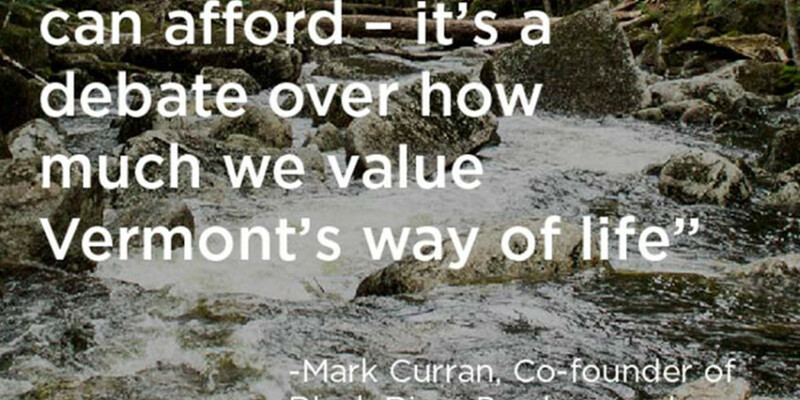 Mark Curran is the co-founder of Black River Produce in Springfield and a member of the Board of Directors at Vermont Businesses for Social Responsibility.